Sound Art. Sound as a Medium of Art with works by John Cage, La Monte Young, Rolf Julius, Timo Kahlen, Steve Roden, Carsten Nicolai, Ryoji Ikeda, Iannis Xenakis and more :: March 17, 2012 – January 6, 2013 :: Opening: March 16, 2012; 7:00 pm :: ZKM_Foyer, Lorenzstraße 19, D-76135 Karlsruhe, Germany. 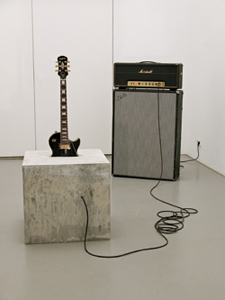 The exhibition Sound Art. Sound as a Medium of Art presents for the first time the development of sound art in the 21st century at the ZKM | Media Museum and in a public space. From Futurism to Fluxus, through to Twitter sonifications, the ZKM charts the history of Sound Art during the 20th century. However, focus is placed on contemporary practices: with works from 70 artists from which approximately 30 new productions from recent years will be represented, the visitor gains insights into the unique sound cosmos of contemporary art. The sound world visualizes its own exhibition architecture, and the exhibition visitor himself becomes the generator of sounds. Visual experience dominates in numerous exhibitions. Sound Art. Sound as a Medium of Art emphasizes auditory experience and transforms the visual experience. The visitor is thus provided with the opportunity to become acquainted with an entirely new sound cosmos, which neither radio, film nor the music industry has been able to establish to such an extent. The Futurist painter and composer Luigi Russolo published the musical manifesto “L’arte dei rumori” in 1913 elevating urban noises to the level of an art. In the 1950s and 1960s representatives of musique concrète and the artists of the Happening and Fluxus movement (from Yoko Ono through to La Monte Young) extended the performative aspect of music; hence, in place of composition there could be randomness, in place of music, silence, in place of an orchestra, the sea and in place of the musician, a horse. In the 1970s and 1980s Industrial Noise influenced even pop music, as well as punk music. The exhibition Sound Art. Sound as a Medium of Art makes new sound perceptions not only experienceable in the museum: passers-by may encounter sounds in the three installations located in the forecourt of the ZKM and five installations in public areas around the city of Karlsruhe. In addition, a selected concert program with outstanding performative projects enriches the exhibition: LaMonte Young, Xenakis, Cage and Ryoji Ikeda are representative of the program’s broad spectrum. The exhibition’s wealth of sounds has also been facilitated by the richness of the archives made accessible to the Karlsruhe public for the first time to this extent. Included are the “unheard avant-garde” from Scandinavia, the Broken Music Archiv from Berlin and curated audiopoints from european archive inventories.